where the Aviatrix controller instance can be in the same or a different VPC. Each customer or managed VPC shares an identical VPC CIDR, security policies and instances. A user who connects to the management VPC should be uniquely address an instance in any given VPC by a private IP address or with a preferred name. The configuration workflow is as follows. It highlights the major steps. The VPC ID field is the AWS VPC ID where you launch the management gateway. The Gateway Name in this example is mgmt-gw. Enable NAT is not selected. VPN Access is not selected. The Access Address Pool is big enough. In this example, we use 192.168.0.0/16 which gives you 16K unique IP addresses. Select mgmt-vpc as the gateway choice. envStamping integrates Route 53 private hosted zone feature to enables you to access instances with DNS names and preferred (alias) names. Skip this step if you do not wish to use names to access instances. 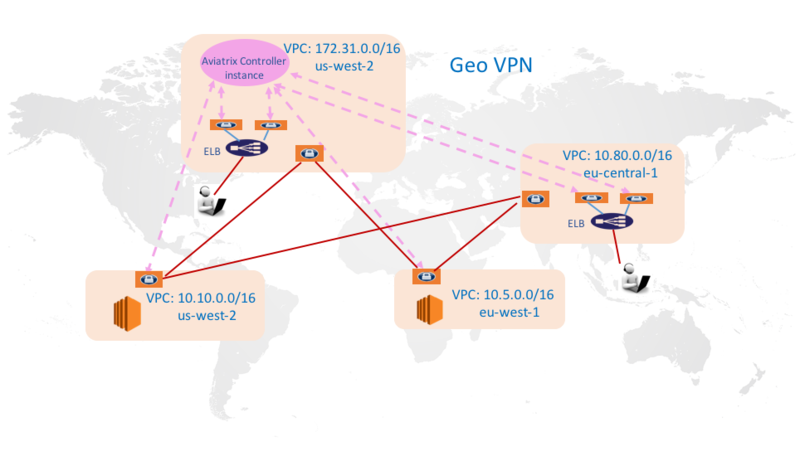 Go to VPC/VNet -> Environment Stamping -> Setup Instance Names -> Config. Enter a private domain name. For example, mydevops.com. Click Enable. a. Enable NAT is selected. b. VPN Access is selected. ii. Split Tunnel Mode is “Yes”. c. Enable AWS ELB is “Yes”. d. Save Template: check to save the template. This step creates a number of managed VPCs and gateways. If you already have existing VPCs, you should use Gateway tab to just create gateways. Make sure VPN access is disabled. Pool Name: a name for this VPC pool. Every VPC created in this pool will have a numeric number append to it. In this example, enter customer. Number of VPCs: the number of VPCs. In this example, enter 3. Enable NAT: check this box if you like the gateway to also perform NAT function. Once VPC and gateways are created, you can launch instances from AWS console or your own CloudFormation scripts. The pool of managed VPC may already have some instances. This step scans and maps instance private addresses in managed VPC to addresses from Access Address Pool, so that you can access these instances via Access Address Pool addresses. Managed VPC: select one gateway from managed VPC. In this example, select customer001. Click Scan & Map. Repeat the above step for all the remaining gateways in managed VPC. Go to VPC/VNet -> Environment Stamping -> Map Instance Addresses -> List to view your instances and their mapped addresses. Add VPN users to the cloud network. Go to VPC/VNet -> VPN Access -> Users. Use Profile to control which user can access what cloud instance/application/ports. When a user connects to management VPC, she can access instances in all managed VPCs. For feature request, click Make a wish at the bottom of each page.